I would buy a Suzuki Samurai for a couple hundred bucks, extend the wheel base a bit, and lower the center of gravity. Then convert it to electric before I'd buy a Sondors E-car. For daily commute I'd want 50km on one charge. Then for long distance I'd just use a regular gas vehicle excellent on fuel, so the 1.6L engine or 1.3L getting ~25MPG or 11km/L which is what new mid size cars get like the Hyundai Elantra. Car and Driver (CD or C/D) is an American automotive enthusiast magazine. Its total circulation is 1.23 million. It is owned by Hearst Magazines, who purchased prior owner Hachette Filipacchi Media U.S. in 2011. Originally headquartered in New York City, the magazine has been based in Ann Arbor, Michigan for many years. Storm Sondors doesn’t like driving. And yet he’s behind an ambitious project to build a $10,000 electric car through a company bearing his name. During Sondors Electric Car Company’s inaugural press conference at the Los Angeles auto show—just outside the exhibition hall in a space that had formerly been occupied by troubled Elio Motors—the CEO expressed his sentiments about driving and didn’t mince words about how he feels about the automotive industry as a whole. “I hate industries; I hate tradition,” he declared, at an event that’s very much an industry tradition. State of that art speed reduction systems prevents vehicle from exceeding 50 mph for a increased level of safety rarely realized in traditional vehicles. Looks like a legit sized hubmotor to me. I wish him well. Hotrodded ES style I bet they rip. Like how fast and on what? We haven't seen a really goofy electric CSO since the ZAP Xebra. Whatever puts oblivious car drivers into slower, quieter machines that impose less danger to others and more danger to them is cool by me, though. MY "problem" is (other than any empty seats plus lots of empty cargo spaces) is the lack of pedals and the weight. To shave off peak power outs at starts and up hills, etc. The WEIGHT of the vehicle. (The Zap weighed 1000 lbs (460 kgs)... "unloaded". "NOT good". For most 21st-century "urban" travels at "slow" speeds. SONDORS, the company behind the impressively-priced $500 electric bike which had one of the most successful kickstarters ever, is now taking pre-orders for their three-wheeled, crowdsourced “Model SONDORS” electric car. The pre-order reservations, which cost just $100, are available on their website and will secure your place in line to get one of the early cars. The fee is fully refundable, minus a $3.30 transaction fee, and if you choose to buy the car when it is eventually available, your $100 will be applied to the price of the car upon making your order. This looks cool, do they have a chance at success? I was hoping Elio was more than vaporware, but they disappeared a while ago. Either Elio is a moron/dreamer, or he's a crook, not sure which and maybe a little of both. I gave them $100 for a pre-order fully expecting I might never see it again. I had realistic expectations that they were probably very likely to fail, but it's still disappointing. Anyone have a feeling whether this Sondors effort is anything besides a scam to sell pre-orders, or possibly drive stock for a pump and dump scheme? Even at $12-15k I bet they could sell a lot of these if they had decent range (100+ miles) and were fun to drive and reasonably safe (ABS + electric brakes, space frame perhaps). Given that Slingshots seem to sell pretty well and they're stupid expensive for a 'toy'. I still feel that small/light is the key to high efficiency vehicles. No, a family can't drive something like this, but for a dedicated commuter vehicle, or people without kids, ~1500 lbs, 3 wheels, ~80+ mpge, it makes some sense. I own a Turbo vw that I upgraded with a larger European intake manifold put in bigger injectors tune etc am know to spank on and and have had numerous road bikes Buell being my favorite. I sold my last Buell before I crashed it as I literally could not stop speeding with it. Word. I talked to Sondors for a few minutes at an ebike event and he seemed pretty sharp and pretty driven to me. It's always easier to doubt than deliver, but I think he at least has a good shot at making it, because it's not like anything he's promising is impossible to deliver or outside possible cost and reliability targets to create a vehicle that lasts at least a decade of only tires and maybe brake pads for track cars if designed right and manufactured right (which no doubt is a significant undertaking). I wish him well and hope his vehicles replace ICE cars all over, and driving my sparrow was a blast, and driving an arcimoto is also a blast, so it's likely this tadpole will also be fun to drive if that motor is fed the right amount of current. If you drove my sparrow, you would have a new respect for tadpoles. Personally I prefer a motorcycle for lane splitting reasons, but tadpoles are my second favorite vehicle topology. If vehicle laws were different Sonders would surely be offering a 4 wheeler. 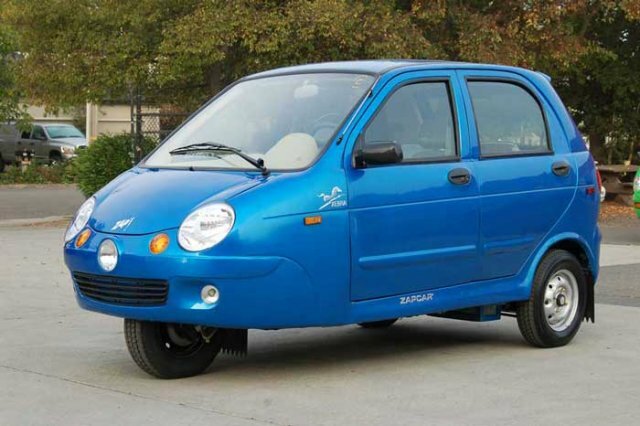 Its a 3 wheeler by force. Its too bad the goal is not highway speeds as many have to travel to work in the city but it is a pretty cool city runabout , e-wheeler. Honestly, I'm kind of digging on the Electra Meccanica Solo, so if this is anything like that I'd be interested. In a comparison to the Arcimoto one thing that is more appealing to me about the Sondors is enclosed cockpit. The Arcimoto is open to the weather isn't it?